Happy July 4th everyone! We have special logos and themes from across the search industry, including a special logo from Google, Yahoo and even a pretty neat theme from us, the Search Engine Roundtable. Dogpile does not have a logo today, I am honestly shocked! They rocked it out the past years. Happy July 4th & Enjoy the Day! 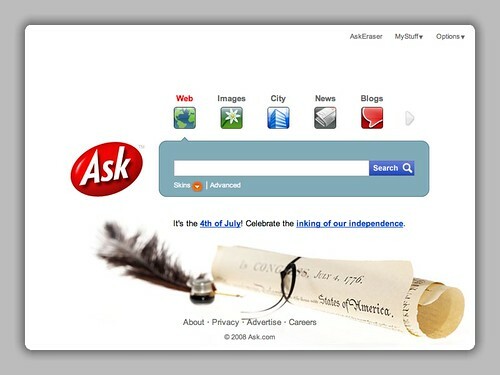 For a look at the past July 4th logos, see 2007, 2006, 2005 and 2004. Hi everyone & happy 4th of July for those celebrating! It's that time of year again, the kids are all fidgety and can't wait to get away from it all. I'll be off on vacation until July 21, when I hope to be back with fully charged batteries (thanks to solar energy :-))! Lots of Googlers are still watching over the groups, and I'm glad that we have so many people regularly active here (thanks, everyone!!) that I know things will run smoothly. John, enjoy the much deserved time off, we will miss you and come back soon! Forum discussion at Search Engine Roundtable Forums and DigitalPoint Forums.